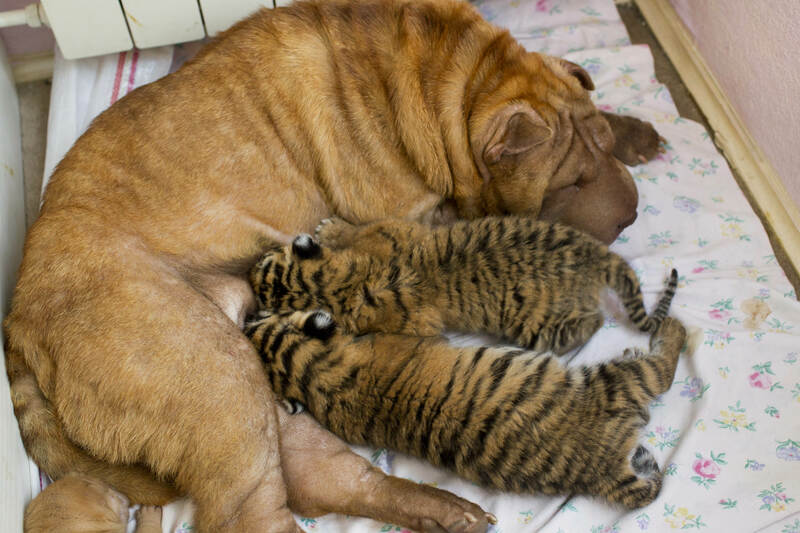 (AP) MOSCOW - Two Siberian tiger cubs abandoned in Russia by their mother have found an unusual wet nurse - a wrinkled, sand-colored Shar Pei dog named Cleopatra, a zoo worker said Wednesday. The cubs were born late May in a zoo at the Oktyabrsky health resort in the Black Sea resort of Sochi. Zoo assistant director Viktoria Kudlayeva said the dog immediately gave the cubs all her attention. "She accepted them right away," Kudlayeva said in a telephone interview. "She's cleaning them and breast feeding them as if they were her own. And they also sleep together." The cubs - named Clyopa, after their adopted mother, and Plyusha - are also being fed goat's milk. Kudlayeva said that the cubs pose no danger to the dog even though they are already showing their claws and hissing. "They aren't aggressive and they depend on her for feeding," she said. Fewer than 400 Siberian tigers - also known as Ussuri, Amur or Manchurian tigers - have survived in the wild, most of them in Russia's Far East.